The social sciences and humanities have developed considerably in the last thirty years in different Asian countries where both theoretical approaches and methodologies have been constantly changing. As a result of the circulation and globalisation of knowledge, new centres and new peripheral areas have been formed and new hierarchies have quietly emerged, giving rise in turn to new competitive environments in which innovative knowledge is being produced. The centres in which knowledge in the social sciences and humanities is produced have moved towards Asia and in particular to China, Korea, Japan, Taiwan and India. In international sociology, sociologists from Asian countries -like Li Peilin, Xie Lizhong, Han San Jing, Kazuhisa Nishihara, Shujiro Yasawa…- are developing their own thinking within real diversity, while at the same time reinterpreting Western theories and are already establishing epistemological networks in order to produce theories at some remove from hegemonic Western paradigms. This pioneering program sets out to contribute to analysis of the ways in which academic knowledge is produced and put to use in a world in which knowledge is circulating ever more quickly. Taking the case of sociological research over the last thirty years and drawing on a comparison of academic trajectories and research practices in France and in China, the project aims to reveal the dynamics of knowledge exchange, evaluation and hybridisation that have developed beyond the hegemonic Western models, disrupting and challenging them. The challenge that has developed over the past twenty years is a major one, revolving as it does around the question of the international recognition of non-Western knowledge. The processes by which sociological knowledge is produced in France and in China vary in academic trajectory, posture and theoretical methodologies, which define specific spaces and shared spaces on the basis of research practices. These spaces come into being on the basis of situated intellectual traditions, exchanges, borrowings and the appropriation of produced and inherited knowledge as well through the rejection, effacement or re-exporting of sociological knowledge that sometimes appears to be universal and sometimes becomes specific. Specific spaces and shared spaces in France and in China are producing Post-Western sociologies and transnational knowledge. The academic program is divided into three phases: a)to analyse the diversity of academic trajectories and controversies of sociologies in France and in China b)to analyse the sociological knowledge and theoretical methodologies c) to realize a multi-sited ethnography and cross-cultural perspectives on sociological practices in France and in China. The results of this epistemological and methodological work will allow us to produce Post-Western Sociology. 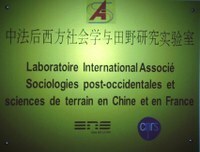 With the creation in November 2013 of the LIA Post-Western Sociologies in France and in China, with the Chinese Opening Conference Traditions, controversies and trajectories of sociologies in France and in China (1) in November on the 9 and 10th 2013 at Chinese Academy of Social Sciences (Beijing) and with the French Opening Conference at Ecole Normale Supérieure of Lyon in January on the 23 and 24 2014 on Traditions, controversies and trajectories of sociologies in France and in China (2), we already have identified and selected some loci of controversy in the production of sociological knowledge in France and in China linked to the theoretical methodology and used controversy as an instrument to analyse the boundaries between conceptual spaces and methods deployed. In the Conference organized in Beijing University in Oktober on the 17 and 18 2014 The fabric sociological knowledge and in the Conference organized at ENS Lyon by Triangle in 2015 June 24, 25, 26 Doing Post-Western Sociology drawing on French and Chinese experiences, we analyzed how a post-Western space has come into being in which sociological knowledge is emerging that is both specific and shared and in which theoretical methodologies are gathered together on the basis of very different histories and traditions. We have developed crossed analysis perspectives in Workshops and in Conference 1. in December 2014 at ENS Lyon on Economic Sociologies in France and in China : crossed perspectives and on What makes religion in France and in China : crossed perspectives 2. In March 2015 at ENS Lyon on Urbanization, segregation and justice in European and Chinese cities and on Globalized capitalism, new collective action and struggle for public recognition in Europe and in China 3. in November 2015 in the Conference on Metropolis, Urban Governance and citizenship in China and in Europe organized at Shanghai University. Since 2013 we began to produce a new common conceptual within which dialogue and intellectual innovation can take place. Doing Post-Western Sociology means examining those forms of knowledge that appear to be specific, those that seem to be the product of reappropriation, reinterpretation, borrowing and hybridisation and those that seem to be have been produced in areas of non-translatability, that is in spaces in which research practices and sociological knowledge in France and in China do correspond or not with each other. Instead of going into the plurality of provinces of knowledge, the most pressing task is to investigate the ways in which continuities and discontinuities, connections and disjunctions are formed between seats of knowledge located in different parts of the world and which are potentially capable of bringing to light a transnational intermediate space that is both local and global, free of all forms of orientalism and occidentalism. From 2017 till 2020 we will develop cross-cultural perspectives on sociological practices in France and in China and co-produce Post-Western Sociology, it means Sino-French concepts and new theories. Li Peilin et Qu Jingdong, 2016, translated by L.Modde, FMSH Editions. L. Roulleau-Berger, 2016, Brill Publishers, Leiden&Boston.